Have you ever been going about your day, feeling pretty good about life, but then, suddenly, get hit by a nagging suspicion that you've forgotten to do something? That's been me all afternoon. As I was picking up the dog's toys (again), it finally occurred to me what it was -- I forgot to blog about our menu plan! So, despite having the plan set for several days, it's coming at you super late today. 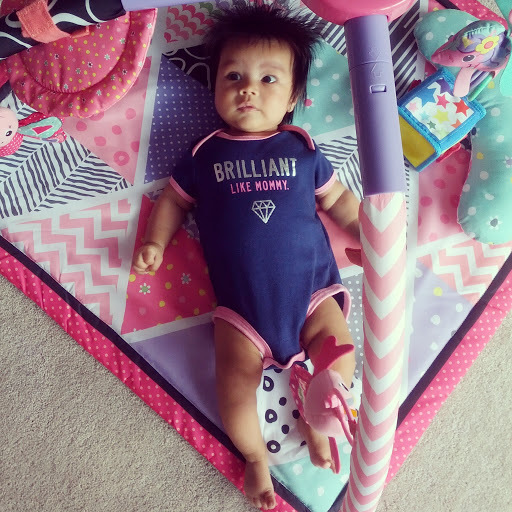 Hopefully, this super cute picture of Caroline playing with her activity gym will make up for it. If you want to see what's on deck for dinner for us this week, then you know what to do!